I spent the last week in Prague, Czech Republic to attend the 15th Global Conference: Perspectives on Evil and Human Wickedness. I was a presenter in the first panel, presenting a paper titled: Dark Side of a Hero: The Villain in the Role of the Protagonist. The conference was excellent and inter-disciplinary in nature, featuring papers on everything from fictitious villains such as the Wicked Witch of the West, to a panel of speakers who spent three weeks in Rwanda researching the lasting impact of Genocide, to a creative piece on the impact of war. Each speaker brought something truly unique to the conference from an international community, as over 11 different countries were represented this year from numerous disciplines of study. It was my second time attending the Evil conference and I can truly say it is one of the more fun conferences I have had the pleasure of attending. Prague itself was amazing! The city was beautiful; one could hardly turn a corner without seeing a magnificent Gothic or Baroque building. This was found on everything from the National Museum to the casual restaurant and offered amazing views of absolutely gorgeous buildings. 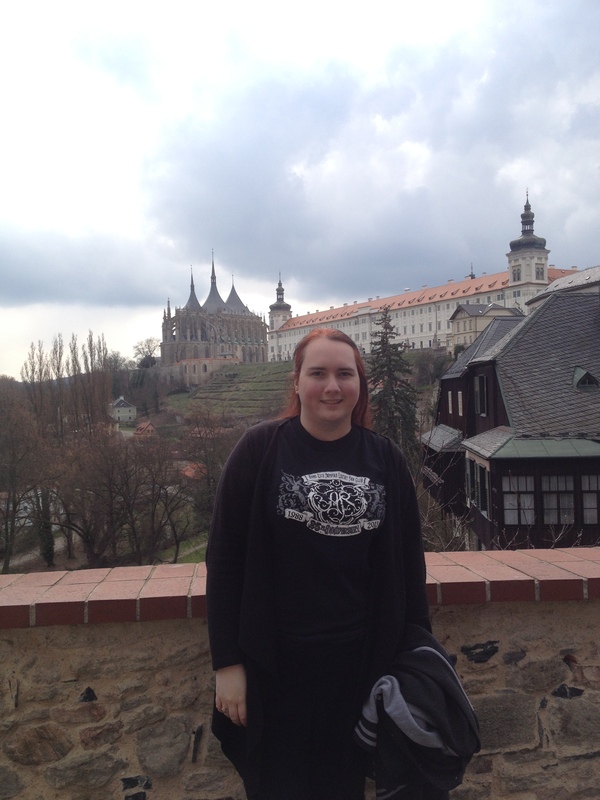 However, for me personally, the highlights were the Sedlec Ossuary in Kutna Hora, just outside of Prague and the Strahov Monastery in the city. The Ossuary, also known as the Kostnice Sedlci. It is a small Roman Catholic Chapel and contains approximately 40,000 human bones. According to my tour guide, the monks started gathering bones from the cemetery surrounding the chapel in the early 1500s. From these bones, they created six pyramids. They did so as a demonstration of equality – to show that, in the end, all people end up exactly the same. 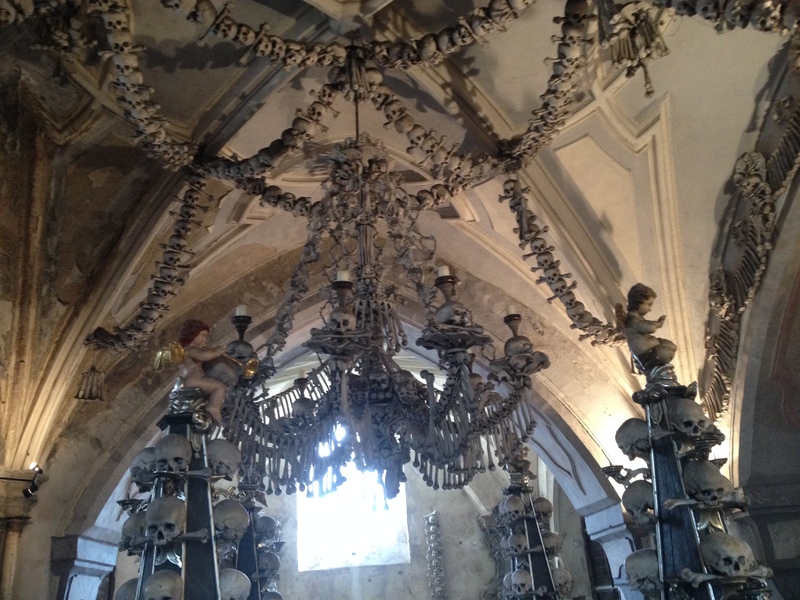 Then, in the 1870s, a man by the name of Frantisek Rint was hired to rearrange some of the bones into decorations which include a chandelier, candle holders and the family crest of the Schwarzenberg family. It was both thrilling and a little surreal to stand within the chapel. 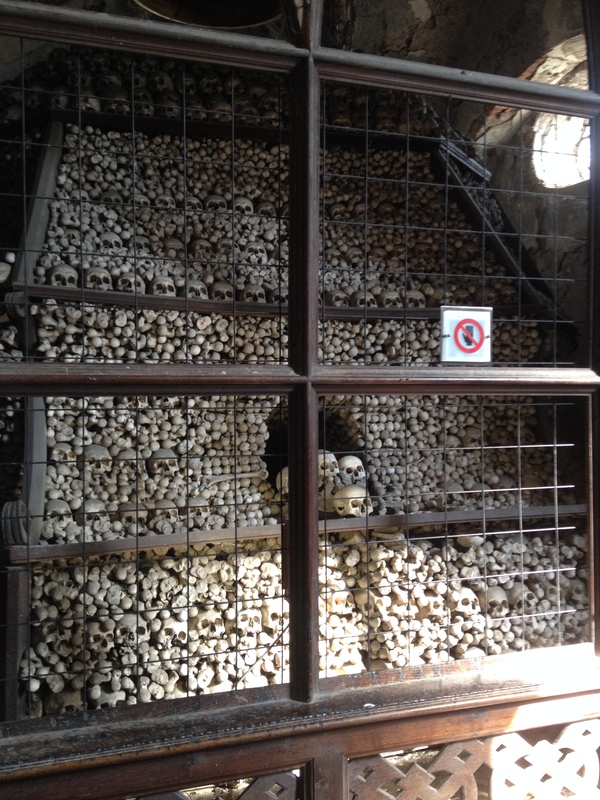 I felt a great sense of reverence standing among those piles of indistinguishable bones and I would highly recommend anyone who has the chance to visit the Ossuary. The tour I took also included a visit to the Church of St. Barbara which was one of the best examples of Gothic architecture I have seen to date. From the towering arches to the numerous painted windows it was both intimidating and awe-inspiring. A walk around the church lead to a bridge lined with statutes intended to be Kutna Hora’s answer to the Charles IV Bridge in Prague. 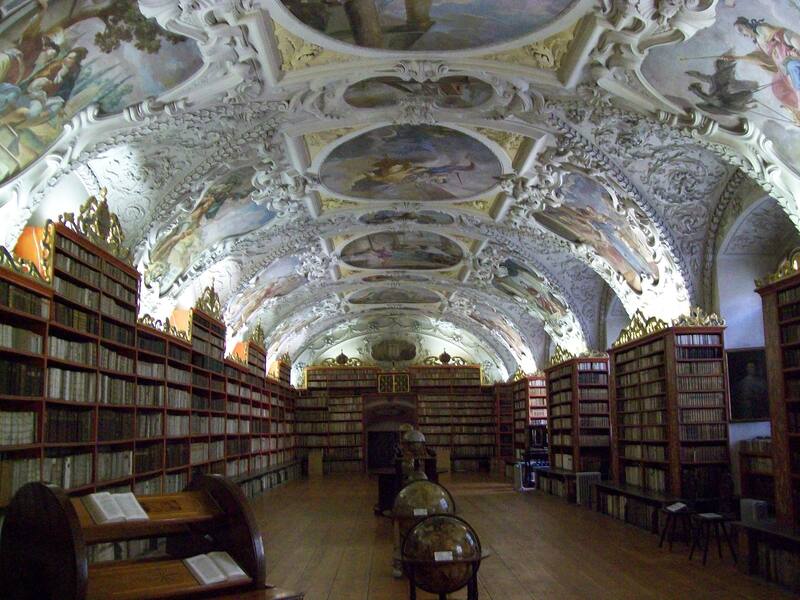 The next day, I went to the Strahov Monastery which was equally amazing. Its library, featuring both a Theological and Philosophical Hall, was recently ranked among the top libraries in the world, and for good reason. In addition to an impressive collection of books, some of which date as far back as the 1200s, the ceiling of the library is what I can only describe as breath-taking. Housing over 18,000 theological and over 40,000 philosophical texts, the two halls are painted with various depictions of what they represent, with the Theological Hall including depictions of scenes from the Bible, from Adam and Eve to Jesus while the Philosophical Hall begins with scenes from Greek mythology to depictions of famous philosophers. It reminded me of work I had seen in the Sistine Chapel in terms of both beauty and history. The layout of the books, particularly in the Theological Hall, really reminded me of the Old Library at Trinity College. I was also fortunate enough to have enjoyed dinner there which was excellent and served with wine and beer from the monastery’s own winery and brewery. An unavoidable part of every writer’s journey is experiencing rejection. How people both come to terms and learn to deal with this rejection varies widely. First, when addressing the rejection letter, it should be noted that there are different kinds and levels. The first is a standard form letter. This is a letter that generally begins with ‘Dear Author’ and are normally not longer than a single paragraph. This is, in my experience, the most common form of rejection letter, as agents often receive far more queries than they can ever hope to personally respond to. The second type of rejection letter is very similar to this one, only it may contain the writer’s actual name at the top, include the title of the piece being rejected, and may even contain a signature at the bottom of the form. Thought this is considered a different level, there is very little different from the first. The third level is a rejection letter which actually states the reason for the rejection. It is often considered a rare gift to receive any feedback in a rejection letter. Should such feedback be provided, it is advisable to at least take the feedback into consideration for future drafts. This, of course, does not mean that one should feel obligated to follow the offered advice; however, it should at minimum be taken under advisement. The fourth level not a rejection letter, but instead a request to read more. When sending an initial query, most agents request anywhere from the first page to the first three pages of a novel in addition to the query letter. A request for more pages or even the entire manuscript indicates that the agent is interested in your work. From this full read, three things can happen. The manuscript can be rejected. The agent can recommend changes which need to be made before they will agree to represent the story, or the manuscript can actually be accepted. However it should be noted that an acceptance letter from an agent does not guarantee a book sale, but merely that you now have someone qualified to pass the manuscript on to publishing houses. It is, generally, an agent’s job to sell the manuscript to the publishers and to represent your interest during any contract negotiations, among other duties. The other form of rejection that a writer must contend with is the knowledge that no matter how good a story may be, there will always be someone who dislikes your work. Preference and taste vary from person to person, so learning to deal with rejection from potential readers is another part of the writing process. Putting ones work into the public sphere can be a terrifying thing; no matter if it debut novel, or your twentieth book in a well-beloved series. I have found that accepting this simple fact – that not everyone will like your work – is the first step towards learning how to best deal with rejection.